Overtime a marble floor will lose its shine. Marble can lose it’s gloss finish from surface scratches, blemishes and light damage. Marble polishing is a great way to regain the natural beauty of the marble. Polishing will take a dull piece of marble and help it to regain it’s sheen and sleekness. Marble has been used for centuries and is a versatile and beautiful stone and needs care and attention to keep it’s luster and shine. Marble floors are an investment that needs regular cleaning and maintenance to keep them looking their best and to prevent any serious damage. 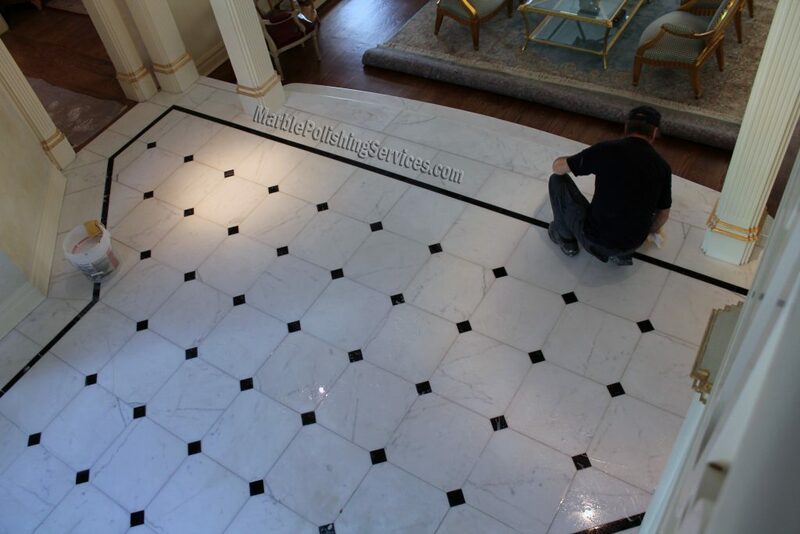 There are two distinct methods to polishing marble; the wet or dry method. The dry method creates dust, but the sandpaper used creates a glossy and professional finish. Coarse sandpaper is used first to cut away ultra-thin layers of the marble. Very little pressure is used. The coarseness of the abrasive pad decreases during the process, which can take up to six steps. This is to help remove any scratches there may be on the marble. The wet method uses water so there is little to no dust. A heavy duty marble polishing machine is used, and the floor is worked on in small areas, about two square meters, with the machine constantly being moved from side to side to buff the floor. The level of gloss and condition of the marble during the process is constantly inspected, to ensure it is of a high standard. The marble needs to be properly sealed so that the shine will stay for as long as possible and to protect it from wear and tear. When the whole floor has been polished, the floor will be rinsed and dried to remove residue that may be left. Restoration is needed when the scratches on the marble are deep and stains have penetrated the stone. Epoxy resins and sanding discs are used to restore the marble. Epoxy resins are an adhesive that sets and goes hard that creates a solid seal. Restorations will be sanded and polished to match the sheen of the original marble. The repaired area will be blended with the original marble so there will be no visible repair. Marble can easily crack if left untreated, so it is important to have it treated as soon as a scratch is seen. We have gained vast experience of polishing and restoring marble in the Westchester, NY area, and take great pride in the quality of our work. We have been serving this area for many years and have highly trained and professional members of staff that provide an unparalleled level of service. We have many satisfied customers that we have helped with our specialist skills in the marble polishing and restoration service. We aim to give our clients peace of mind in how we handle your marble surfaces and leave you with a quality finish. Marble Cleaning Westchester NY, Marble polishing Harrison ny, Marble Polishing Westchester NY, Marble Repair Westchester NY, Marble Restoration Westchester NY, Marble Scratch removal Westchester NY, Marble Sealing Westchester NY, Marble stain removal Westchester NY, Stone & Marble Maintenance Westchester NY, Westchester Marble polishing, Westchester NY maintenance, Westchester NY Marble cleaning, Westchester NY stone care.